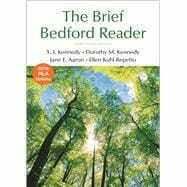 Long one of the most popular composition readers on the market, The Brief Bedford Reader combines timeless readings with the leading voices of our day. It takes a practical and flexible approach to the rhetorical methods, focusing on their uses in varied writing situations. The unique and newly reimagined "Writers on Writing" feature connects reflections from professional writers with point-of-need advice for student writers, and the Kennedys' class-proven instruction helps students connect critical reading to academic writing. The thirteenth edition has been thoroughly revised with compelling readings, helpful guidance for students on critical reading and writing, and an appendix covering APA documentation and 2016 MLA documentation MLA and APA documentation.Comprehension quizzes are also available for each reading in the book when The Brief Bedford Reader is packaged with either Writer’s Help or LaunchPad Solo for Readers and Writers. Jane E. Aaron is a professional writer and editor as well as an experienced teacher. She is the author of the best selling Little, Brown Handbook and coeditor of the best-selling Bedford Reader, Eighth Edition (Bedford/St. Martin's, 2003). She has served as consultant, editor, or writer on more than a dozen other textbooks for the first-year composition course. Ellen Kuhl Repetto (M.A., University of Massachusetts Boston) is a freelance editor and writer who has contributed to more than twenty composition readers, handbooks, and rhetorics. She is the author of The Bedford/St. Martin's Textbook Reader (2003), Readings for Discoveries: A Collection of Short Essays (2006), and Hope over Hardship: A History of the Boston Home, 1881 - 2006 (2007). SHOULD COLLEGES ADOPT TRIGGER WARNINGS?